8 years had surpassed since I last stepped foot upon Grampians soil. From vague memory, our photography club had aimed to reach The Pinnacle but didn't reach there in the end due to the hot weather and the fact that everyone was carrying heavy camera gear. Not a great combo! The day before we left Mr. T and I were hoping for decent weather after seeing predictions of thunderstorms and rain during the afternoon. Thankfully, it only applied to metropolitan Melbourne and the weather Gods were nice enough to wait until after we descended from the lookouts. The short 4.2km hike to The Pinnacle lookout was worth all the sweat. Some climbing and hopping across rock platforms are involved. Do wear sturdy shoes with decent grip and don't forget the sunscreen. Some people we passed were wearing thongs and jeans - curious to know whether they made it to the top or not! We found that The Pinnacle was the only spot in the Grampians which had cellular reception. If you think you're off track, keep a lookout for any yellow or pink arrow markings on the rocks. Due to a heavy flood back in January 2011, some roads and paths were damaged. The information centre said they have spent at least $31 million dollars trying to fix it up. Do check the information bulletin on the Grampians National Park website for any updates on road and track closures. Mackenzie Falls was a somewhat short 1.9km descent. However the elevation was quite high therefore we had to take several breaks going back up. 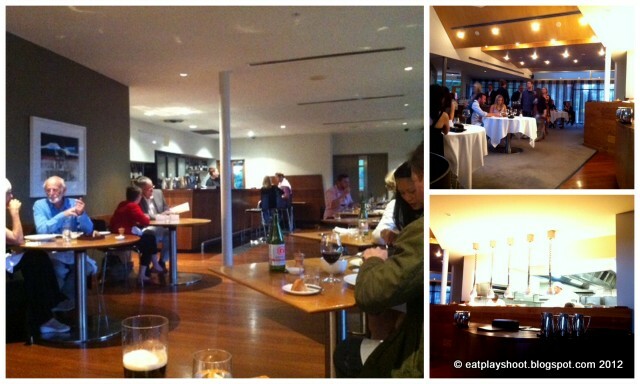 That evening we rewarded ourselves with an ala carte dinner at The Royal Mail Hotel in Dunkeld which was about an hours drive away from Halls Gap. The restaurant was fully booked out since October 2012 but we were happy to sample the bistro menu they had on offer and to choose our own dishes. The only differences between the restaurant and bistro side were: (a) restaurant side is carpeted while the bistro has floorboards (b) restaurant side uses white tablecloths while the bistro end used the bare table surface (c) degustation options only offered in the restaurant (d) ratio of waitressing staff was considerably higher on the restaurant side (that was a given). Compared to other 3 chef hat restaurants such as Vue De Monde, Jacques Reymond and Attica, I found the atmosphere at Royal Mail Hotel a bit lacklustre. I was expecting some 'wow' factor since the first thing you notice walking into the dining area was the minimalistic decor. Although we had good views of the open kitchen, glancing over to the restaurant area made me wonder it had to be the service of the staff to bump up the score as I felt something was missing. It didn't entice me to want to experience the degustation menu at all. At least the food sort of redeemed itself. For starters, Mr. T ordered the Smoked trout rillettes and whole wheat toast ($18). The texture of rillettes is similar to pate, think of mashed up cooked salmon with herbs. The seasoning was perfect and I could eat it for brekky too. My entree was the Slow cooked egg, salt fish and mussels, potato and fish crackling ($24). Interesting and delicious combination. I didn't know where to start eating! The fish crackling was amazing in flavour, made the humble prawn cracker seem inferior by comparison. Main: Flinders Island salt grass lamb, charred onions, broad bean, mint and lemon balm ($38). I've seen previous photos were the broad beans were made into a puree. There was too many broad beans on the plate to polish off. The lamb had a distinct flavour and was cooked well. Side dish: Brand new potatoes (from their garden), butter, herbs. I thought the edible microherb flowers didn't go well with the potatoes and could be omitted. Main: Milawa organic chicken, cauliflower and jerusalem artichoke, wild rice and bread pudding ($36). Their "wild rice" was puffed rice immersed with cauliflower bits. The chicken was juicy and not dry at all, the accompanying jus was perfect. This was my first bread pudding but thought it had no flavour? Are they meant to be like that? We shared the dessert as we were too bloated by the time our mains were cleared. Hazelnut mousse, chocolate and honeycomb ($16). The consistency was more of a cream than a mousse but that satisfied our sweet tooth. The bitter dark chocolate was subtle and combined well with the flecks of honeycomb pieces and the not-too-sweet hazelnut cream. The following morning we had complimentary cooked breakfast at the Bistro. My order of soft boiled eggs with bacon bits and walnut bread soldiers was a light way to start the morning ($12). Mr T ordered the RMH's "big breakfast" option. A single piece of toast was mounted with all the toppings (tomato, pork sausage, scrambled eggs). After experiencing various brunch sessions, I've definitely seen more bigger and interesting options especially when the normal price tag was $24! The grilled tomato tasted strange, like it was doused in butane gas?? Thank goodness it was included as part of the hotel accommodation stay. The continental breakfast offerings were decent and paid homage to the local produce in the area. Although we stayed in the mountain view room, it wasn't much of a view unless your cabin was located towards the back of the property. I was expecting more for that price ($280 per night) and was disappointed. The rooms felt ordinary and not luxurious at all. The only good thing was that they stocked Peter Morrissey toiletries. We found ants in our first room along the skirting board, bathroom and desk which they promptly arranged for another transfer. If you're going to stay here, opt for the cheaper Garden view room instead. Grampians makes for a lovely weekend trip away if you don't want to rush getting back to Melbourne on the same day.